Chameleon takes place on a grid of colored hexagons far taller than the dual screens can show (you can zoom out to get a better view, thankfully). You start at the bottom of the playfield, with only one hexagon under your control, and your opponent begins at the top. When it's your turn, you select one of the seven colors; every hex you control changes to that color and any connecting hexes that are also that color become yours as well. So, if your current color happens to be red, but there are three yellow hexagons touching you, all you have to do is change to yellow, and those are absorbed into your territory. Then, if there are blue hexagons touching the yellow, you pick blue next time and all of your territory turns blue, absorbing the blue hexes as well. And so it goes until one player collects 50% of the playfield, ending the match. The only real deviations in this routine are that you can actually only choose from five of the seven colors on any given turn - the two colors chosen most recently by either contestant are off limits - and that the players have super-powers. Each of the five selectable characters (all anime girls, for reasons never fully explained) has two different abilities they can use if they capture special star-stamped hex tiles. These range from stealing turns or setting color-shifting bombs to randomly re-coloring every unclaimed hex on the grid, so they can certainly affect the outcome of the match. 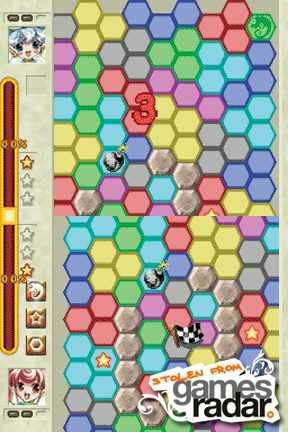 Description Colored blocks are sooo over... this color-shifting puzzle game uses hexagons instead. But it blends in too much with the competition.